We love muffins in our house and usually have them several times a week. When I make muffins I almost always make a large batch and put some in the freezer for those busy times when I don’t have time to bake. They make a great addition to almost any meal, but they also make great snacks and desserts. This double chocolate muffin today is definitely more like a dessert. And although my kids have been known to eat these for breakfast, they really are more of a treat type muffin. Line a muffin tin with paper liners. This makes 24 muffins. In a bowl combine rice flours, cornstarch, sugar, cocoa, baking powder, baking soda, and salt. Beat in buttermilk, oil, eggs, and vanilla just until combined. Bake for 17-18 minutes or until done. Great for the kids back to school lunches too! Yes, they would be perfect for that! Thanks for the recipe. Now that she can have some dairy and eggs that are baked in things, I think I will try buttermilk and see how that goes. Do you think it would work to use something like almond milk in place of the buttermilk? I have not used almond milk, but if you use it in other recipes it would probably work ok in this one. would this work as a cake? Yes, I think it would work ok as a cake. Just made these for my daughter who has had to go gluten free recently. 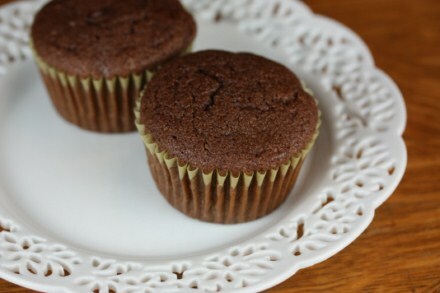 Really moist, great chocolate flavor and you would never know these are gluten free. Thanks for the great recipe! I love hearing that you could not tell they were gluten free. I am so glad that you enjoyed them!